Amir Sagie coordinates the political work of the Consulate in the tri-state area. L-R: Arthur Katz, Ellen Birnbaum, George Maragos, Judy Jacobs, Vincent Muscarella, Edward P. Mangano, Amir Sagie, Norma Gonsalves, Mindy Perlmutter, Andrew H. Gross, Steven Rhodes, and William Gaylor. 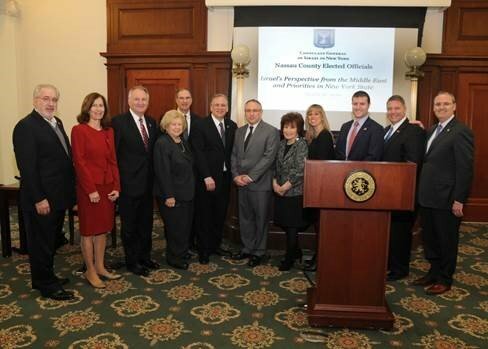 March 17, 2016 - Nassau County Executive Edward P. Mangano and the Jewish Community Relations Council of Long Island hosted Israeli Deputy Consul General Amir Sagie on March 16, 2016 in the Theodore Roosevelt Executive and Legislative Building. “On behalf of the Nassau Legislature and the Jewish residents of our County, I am grateful to host Deputy Consul General to Israel Amir Sagie as he discusses international security, which is a topic of great concern for all of our residents,” said Presiding Officer Norma L. Gonsalves. Amir Sagie is the Deputy Consul General of Israel in New York. As Deputy Consul General in New York, Israel’s largest mission in the world, he coordinates the political work of the Consulate in the tri-state area, developing relations with national, state and local officials. He maintains regular contact with experts involved in major foreign policy and strategic issues at think tanks and universities across the region. He also acts as the liaison for the Foreign Ministry with the national and local leadership of the Jewish Community based in New York. In addition, he coordinates interfaith dialogue and outreach nationally for the Foreign Ministry and its missions in the United States. Subject: LongIsland.com - Your Name sent you Article details of "Mangano Hosts Israeli Deputy Consul General Amir Sagie"